One of my favourite books as a girl was Dale’s Mango Tree. Right now, as I’m trying to explain to you why I loved it so much, all sorts of words and emotions are tumbling over themselves inside me. Where to begin! I had my mum read it to me scores of times, and then when I was old enough I’d read it to myself. Several moves and countless book purges later, I still have my copy. It’s going nowhere. Why am I telling you about a random book from my childhood? 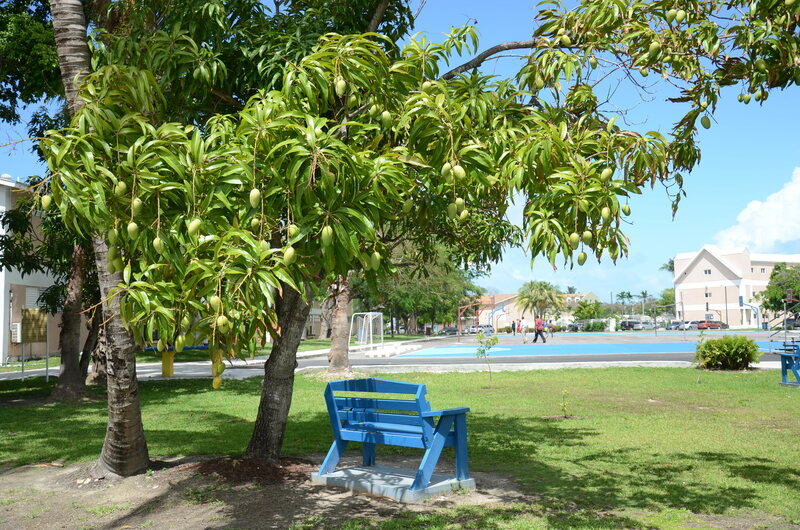 There’s a mango tree on the University of the Bahamas campus that makes me think of the story. I walk by it every day on my way to class, and this semester saw first the blossoms, then the fruit appear. The tree is small, and the mangoes hang tantalisingly low. They’re not nearly ripe yet though, and I wonder who’s going to get to eat them. Basically, I’m hoping it could somehow be me, which now that I think about it, is one reason the tree reminds me of the book. Dale is a little Jamaican boy who is mean to his younger sister, and gets in trouble for his bad behaviour. Thanks to Dale, I learned the word ‘contention’, which is what his grandmother always fussed him for causing. Dale also has a mango tree, and he’s excited for its fruit to ripen. Initially, his plan is to eat all 3 himself, but – spoiler alert! – he shares with his sister and mother instead. Sharing his mangoes brought him more joy than keeping them to himself, and by the end of the book everyone is smiling. Dale’s Mango Tree was one of the few books in my childhoood collection where I felt visible. Dale had brown skin, like me, and he loved mangoes, also like me. He called his mother ‘mummy’ and lived on an island not far from mine. Did your parents do the accent thing when they read books? My mum did, and after years of law school in Jamaica her Jamaican accent is pretty good. Hearing her read the story aloud only deepened the connection I felt to the setting and the characters. I didn’t understand how important all this was at the time, but I’m sure it has a lot to do with why I’ve hung on to this book for so long, while my others are buried in memory. Representation matters. It was Dale’s mango tree, not apple or pear. He didn’t have a strawberry bush in his backyard, or go blueberry picking. I loved reading about children that had and did all those “exotic” things – I ached to be a Bobbsey twin – but aside from Dale, I didn’t see children that had trees and ate food like mine. This gap is at the heart of this blog too, one of the reasons I determined to start it; I read a bunch of food blogs, and over time became more aware of the absence of voices like mine. I wanted to see pictures of palm trees and pigeon peas and the ocean, and read about the food that’s popular around me. I’m proud of what we have and want us to be part of the conversation! It’s also important to show this tropical life is more than a vacation, and is worth exploring. A larger question I have concerns the way global class, power and economic dynamics play out in the domain of food. I think about other under-/unrepresented regions and ethnic groups – why don’t we see them? What does that mean? I love reading about dishes, trying out recipes, and have a serious sweet tooth. Even so, there’s more to gain more from food than delightful in-the-moment experiences. 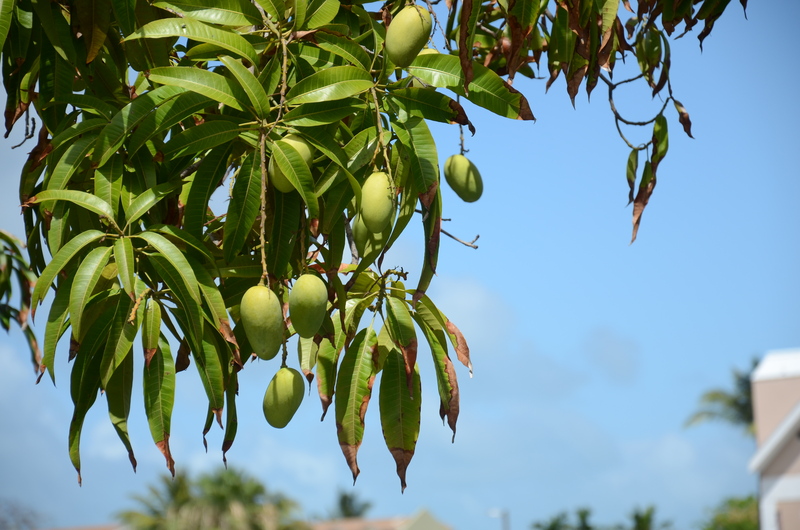 I hope that this blog will be a little like Dale’s Mango Tree was for me when I was a girl. I hope too that it will prompt musings and revelations on our humanity, through our shared need for and enjoyment of food. This was beautiful! I feel the same: I love food blogs but I definitely feel there’s a lack of Caribbean voices (and food smt!) in that space. Aw thanks Zel! ^_^ When you come home maybe we can work on a post together! This looks amazing! I have never seen a mango tree before!